Warning: Very minor (non-plot related) spoilers for season two of The Punisher. After stealing every scene in season two of Daredevil, Frank Castle returned with his own show as The Punisher in 2017. Season one of The Punisher breathed new life into the revenge genre. In some ways, Frank Castle’s story follows the genre’s tropes closely: a fridged wife and an angry man on a killing spree. But The Punisher also explored complex themes, such as the meaning of war, how foreign war spills back across American borders, and what it means to be a Veteran living with PTSD. It had layered and interesting female characters. The show also offered a level of writing and acting that created indelible characters and inspired passionate fandom. When we last saw Frank Castle at the end of season one, he had killed or incapacitated everyone who murdered his family. As season two begins, Frank is facing a much different challenge. He’s a man without a mission, wandering aimlessly on the open road. He stops in a small town with great dive bar. A pretty, down-to-earth bartender named Beth takes a liking to him, and he goes home with her. Their conversations are awkward but sweet, and their love scene has chemistry to burn. It reminds those who may have forgotten that Frank can be tender, and Frank is smoking hot when he isn’t covered in other people’s entrails. And for a moment, he considers stopping and trying to cobble together a normal life. But that idea lasts about 5 minutes. A teenage girl named Amy is also at that bar both nights. She has run afoul of some powerful people and is being pursued by trained assassins. When Frank sees that Amy is in danger, he reacts immediately. He kills a gang of people and then abducts Amy and runs. Amy is frightened and cannot figure out why he isn’t just letting her go. This is the first question the show asks. Why doesn’t Frank let her go? Is he just an over enthusiastic abductor-hero? Or was he spoiling for some violence again? Probably a bit of both. Either way, we have our first villain and first threat to Frank — the shadowy billionaire who is out to kill Amy. This billionaire sends a fundamentalist religious former neo-Nazi assassin named Pilgrim to kill Amy and Frank. Pilgrim is a relentless, cold-blooded killer. Meanwhile, Billy Russo wakes up. He is scarred, and his mind is jumbled. His last memories are of being in the barracks with his “brothers.” He only remembers Frank as his best friend. But he knows something is awry. He is told that he shot Madani in the head, and every time he closes his eyes, he has hellish nightmares. He’s not the man Frank put into a coma. A smug therapist is trying to help him put the pieces back together and is complicit in his escape from the hospital. When Madani, Curtis, and Frank find out about Billy’s escape, each becomes (even more) hyper vigilant. They know that as soon as Billy finds out who put him in a coma, he is going to come for them. The tally of Big Problems Frank Has is now up to two – Billy and Pilgrim. But Frank isn’t one to hide from a fight. He decides to kill everyone before they kill him, while attempting to keep Amy safe. 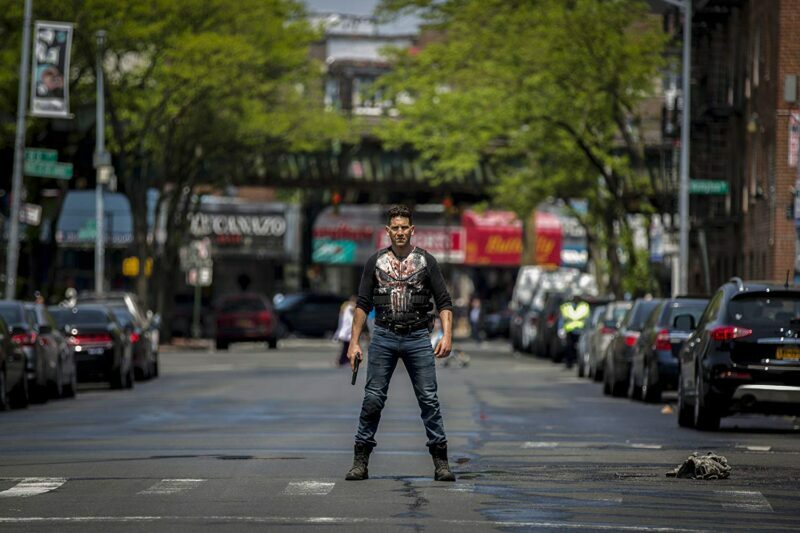 Jon Bernthal as Frank Castle in ‘The Punisher.’ Image courtesy of IMDB.com. That is the basic premise of the season, and it results in thirteen episodes bursting with sheer relentless violence. In terms of action, season two of The Punisher takes everything from season one and magnifies it exponentially. Frank Castle drops even more bodies in even more brutal and inventive ways. Frank kills people with free weights. With pipes. With guns, knives, and literally anything he can get his hands on. Even the bathroom sink. In this heightened fantasy world, torture yields to actionable intelligence, and murder is the best solution to any problem. Values like a fair and speedy trial or thou-shalt-not-kill are passé. They just slow you down. Adding to the escapism, Frank survives more than any human body could withstand. He is beat to a bloody pulp, stabbed, and shot. His survival rate has more in common with The Terminator than with a mere mortal. As far as the plot and our two villains, the Billy Russo arc works better. Recycling villains can be anticlimactic or feel repetitive. Didn’t we spend all last season getting rid of this guy? But Billy is a different villain. He is transformed by his physical trauma and memory loss. He is now Jigsaw. Instead of cold and calculating, he is unstable and unpredictable. Instead of smooth and scheming, he is burdened with grief and rage. His memory loss begs the question, If he can’t remember turning evil, will he still be evil? Finding out who this new Billy is and what choices he will make maintains the tension consistently. Ben Barnes is fantastic as well. He digs into this role with intensity. The billionaire plot line adds stakes, but it doesn’t invite the same level of engagement. For one, this billionaire couple is supposedly trying to install their U.S. Senator son as President of the United States. Yet you never see them doing anything to accomplish that. They aren’t involved in politics, nor do they even speak to anyone other than Pilgrim and his family. Also, you don’t see Pilgrim for long stretches. He gets waylaid by his old neo-Nazi buddies and just drops out of the story. There are interesting themes in this plotline. Pilgrim long ago left this life of crime. But he’s being dragged back in. Will it consume him? Did he ever even change? Or was it an illusion? But he drops in and out so often, the tension doesn’t hold. As for the returning characters, it is great to see Madani, Curtis, and Mahoney again. Just like in season one, I found myself constantly worried about Curtis (protect him Lord!). Both he and Madani work with Frank to resolve the Billy Russo threat, while trying not to get sucked into the Frank vortex of insanity. Also, we get to see Karen Page again. Her chemistry with Frank is wonderful and I wanted more. The new character Amy is a successful foil for Frank. It’s tricky to drop a teenager into a violent adult story like this. It could have been saccharine, irritating, or exploitative. But she strikes a good balance. She is smart mouthed, but scared. She is a survivor, but way out of her depth. She calls Frank on his crap, but she can’t push him too far because – let’s face it – he’s terrifying. But the best part of The Punisher is still Frank Castle. There is this belief that a vigilante has to be in constant conflict with himself in order to be interesting. Frank shows that’s not true. Let other vigilantes torture themselves over whether to go dark-side and kill. Frank is clear that he is a killer. Let every other character in the show debate whether Frank is a hero or a villain. He’s just going to keep being Frank. He’s the walking talking avatar for our rage. He carries out every violence we wish on people who kill and victimize the vulnerable. Yet he still has layers. And showing us those layers is never cheap. It is always earned. He can go from a killer to a protector. He can go from rage to grief to tenderness and back again. His perma-exhausted resilient grit is fun to root for. And it will never get old to see some bully pick a fight with him, having no idea what awaits him. But my favorite layer to Frank is his awkwardness. He is so out of touch with normal human behavior, but he doesn’t always realize it. This disconnect results in a lot of darkly humorous moments, especially when he tries to help. There is a moment where Amy is distraught because she has had to shoot someone. Frank: No. No, you just shot him, ok? Hey, right? Frank is sincere and conciliatory. He’s desperate to help her feel better. Amy sniffles and looks down at the incapacitated man. The man stirs. There are clear signs of life. Then, without missing a beat, Frank turns and puts a bullet into the man’s head right in front of her. Frank: See that? I killed him. The solution was so “Frank” and so absurd. He really thought he was helping! I laughed so loud, I startled my dogs. Frank Castle’s magnetism is also a testament to Jon Bernthal’s acting. This has to be one of the best cast roles in comic book adaptations or really anywhere. Frank isn’t a character that’s going to spend too much time talking about his feelings. But Bernthal can show them all on his face. Another thing that sets The Punisher apart from the pack is its attempts to raise complex questions and invite critical thinking about Frank Castle. The results of that in season two are mixed. Providing unfettered violence while critiquing unfettered violence is tough to pull off. And as much effort as the show puts towards great female characters, it is women’s bodies that are grist for the mill in Frank and Billy’s machinations. But the show does spend considerable energy pushing back against the idea that Frank Castle is a hero. Killing everyone who killed his family is one thing. But walking into a warehouse of garden variety criminals with a semiautomatic and spraying bullets into everything that moves? Why does Frank get to devalue human life in such a way? Who is he to decide who doesn’t deserve to live? After all, the most significant predictive variables in being branded a criminal are race, class, and geography. It isn’t an objective designation, and it is often an unjust one. And while vigilantes do defend the vulnerable when the justice system has failed them, the systematic rejection of personal rights in real life only benefits oppressors. Ultimately, the show doesn’t tell us what to believe. We get to decide for ourselves. At one point, Madani tells Mahoney, “Frank isn’t a criminal. And he isn’t a hero. He’s just Frank.” But Frank is categorically a criminal. He is also a hero, especially to Amy. But Madani got one thing right. Frank is just Frank. And he provides great television. Next story ‘Lucifer’ Convention Tickets Now on Sale!